There’s a new craze that is sweeping through Edenbridge at the moment. You may have already seen some whilst walking through the area going about your daily business. You might be a part of the craze already, or you have yet to discover your first decorated rock. What began as an idea by a lady in Devon last year to keep her friends’ children entertained has now swept across the nation and adults are joining in on the fun as well! In Edenbridge we have Bryony Baldwin and her mother Jo Gordon to thank for bringing the craze here. They had seen a few other Facebook pages about it and Jo’s sister in Crowborough was already part of the ‘Crowborough Secret Stones’ Facebook Group. 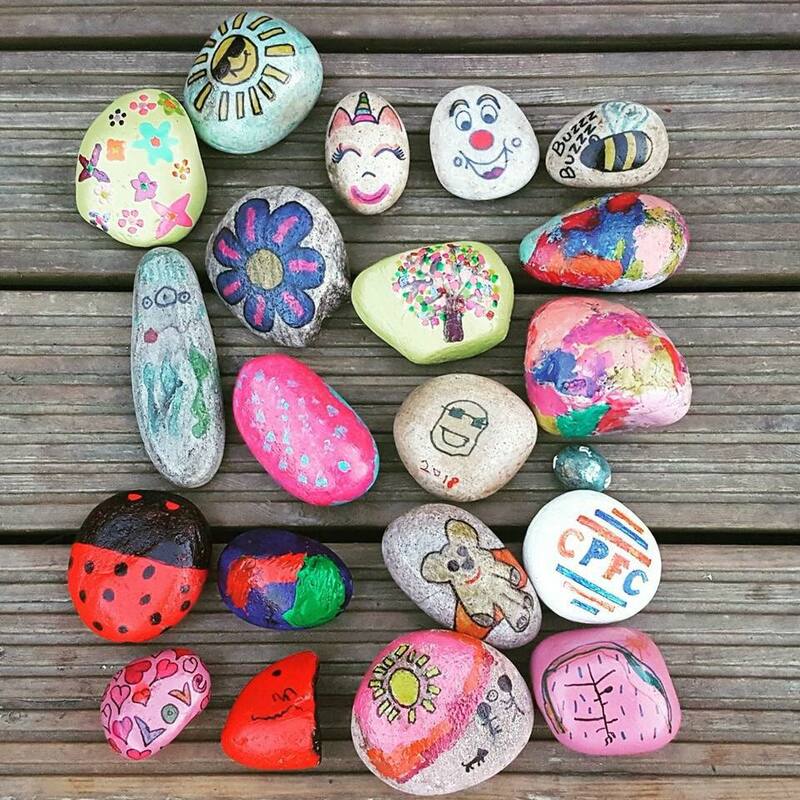 They set up the ‘Edenbridge Rock Painting’ group on Facebook on 16th May 2018 and to date there are already 790 members. Edenbridge Rock Painting – fun rock painting activity for children and adults – all you need do to is paint a stone and hide it anywhere around Edenbridge. Big pebbles or cobbles are the best type of rock to use as they’re smooth to paint or draw on. Acrylic Paint or Sharpies are the best to use on the stones and will not wash off. You can also use nail varnish to paint, and if you wish you can seal your painting with varnish. Please don’t use any stickers, foam stickers, goggly eyes or stick on jewels as these tend to fall off on wet weather and can be dangerous for the animals! Please write ‘Edenbridge Rock Painting Facebook Group’ on the back and ask the finder to post a photo onto the facebook group. Also leave a message with what you would like to be done with the rock – i.e ‘Please re-hide me’ or ‘Please keep me’ but paint a new rock and hide it’. Its also a personal choice as to whether you’d like to write your name on the back so people know who it belongs to! Hide your rock around the local area, in places that people are guaranteed to find them whilst they’re walking around. Once you find a rock, take a picture of it and post on this group to let someone know their rock has been found. Once you have found the rock, please do with it whatever the wishes are on the back. If the wish is for you to re-hide it, then hide it in a new location. Feel free to give hints of the hiding place if you wish to! The feedback that has been posted on the Facebook page has been so positive with comments from parents who are delighted their children would rather be walking than in the car so that can seek out rocks that have been left by others. While you’re out, why not take a bag and collect some rubbish that you come across at the same time!